...I took the rocky road. *Two back-to-back literary references--my English-loving little brother must be so proud. We're all familiar with the combination of ingredients in a dessert bearing the "rocky road" descriptor--chocolate, marshmallows, and nuts. [I think the components are a bit different (but just as tasty) in other countries.] There are cookies, cupcakes, ice creams, fudges, cheesecakes, pies, and even bread puddings. Me? I went with bars. Why? Because I'm lazy. Instead of the brownie base seen in many rocky road bars, this recipe makes use of graham cracker crumbs. I used a blend of chocolate ones and regular ones to make the end result more cocoa-flavored; they also made the bars a bit reminiscent of s'mores, which could never be a bad thing. The nuts I went with were pecans (from the Green Valley Pecan Store, to be exact, which just so happens to provide the finest pecans I've had the pleasure of eating). This is a quick, fool-proof, and tasty treat, and I'm glad I went down the rocky road. Combine graham cracker crumbs, sugar, and melted butter in an 8x8-inch dish. Toss to thoroughly combine and press mixture firmly onto the bottom of the pan. Scatter (or painstakingly layer) 1 cup of the pecans across the top and bake for 15 minutes. After baking, remove the pan from the oven and sprinkle with 1 cup of the chocolate chips, the marshmallows, the remaining pecans, and then the remaining chocolate chips. Return the pan to the oven and bake 10-12 minutes, or until marshmallows are lightly browned. Good morning, my friend!! I miss you! 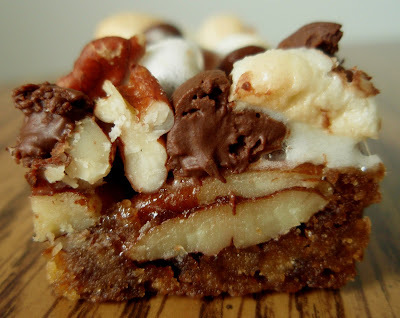 Your Rocky Road bars look really yummy!! Can't wait to try them! Yum Yum! I did a version of this a looooooong time ago. I remember it being a hit w/ the kiddos. They totally look S'more-ish. Look at that! Those nuts and marshmallows and the graham cracker crust. That looks incredible! These looks fabulous! I'm drooling at that last ooey, gooey pic. I know what I'm making for our July 4 get together. Thanks for sharing! No matter what, I always leave your site drooling. 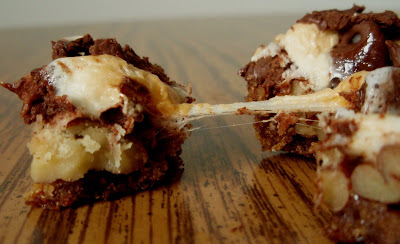 My s'mores loving sister will LOVE these! ooo it's everything yummy in one! Not only does your cleverness astound me (love the not-so name of the bars AND the reference to the lovely poem) but these bars look astounding, as well. Anything in bar form gets my vote for simplicity. Wow! These look SOOOOO good!!! I'm not known for being a great baker, so I love making bars, also. These seem easy enough, so maybe I won't screw them up. My son will thank you! Oh Grace you are hurting me with that stretched marshmallow pic! oh wow, this is saving me from cocoa pebbles marshmallow treats! Much livelier ingredients, but what... no cinnamon! While I am not usually one for nuts in my dessert (I do make exceptions), this might have to go on the exception list. hahaha how yummy! i love that poem! I'm glad you took this road!But really, I just gained 5 pounds and I can't quit drooling at these pictures- I must make these! BAD, Bad, Bad Bad!!!!! Especially those sticky, stringy marshmallow photos! Mmmmm! Nutty S'more Bars. Sounds decadent. I wouldn't mind a bite....and these sound so easy to make that it wouldn't be much of a stretch to think I might go put them together right now. Lovely,;;;this is pure evil!! Yummie evil!! I'll take the high road with these bars. Delicious! These look awesome. Very indulgent. My kids would love them. You are so clever and that picture of pulled marshmallow is food cover worthy. Impressive! Yum, that looks so good. And the piece there is so small. That wouldn't hurt anyone! Well, I'll take the fork in the road and use it to eat these. Thanks for a great recipe and a (great) bad joke. Yum! Those look amazing.... especially the last photo! 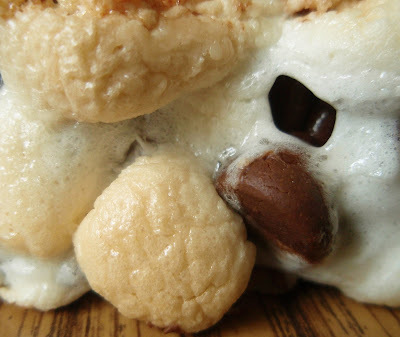 Love how gooey the marshmallows look! oh Wow! These pictures are ridiculous! I want one now! Look at you, literary references and everything! I know you are thin, so I think either you have an amazingly super fast metabolism or your coworkers are VERY fast. How could they ever resist all this yummy, ooey, gooey, deliciousness of yours!?!? Sounds delicious as usual, Grace, and easy too! You out did yourself on this one. Looks like the perfect treat to me! I'd take that rocky road too. The bars look incredible. This is the perfect treat for everyone, I think. Job well done. Anyway, I'm sure these bars would put me down the road I'm glad I travelled. They look scrumptious! yes please. :-) love that marshmallow photo! Oh wow drool I'd loooove one of those!! Do you think PB chips would work for those allergic to chocolate? I'm staggered by how delicious these look. I love the big chunks of pecans in there. Slurptastic! Only one word to your ROCKY ROAD BARS! WOW!!!! OK, one more...delicious...one more...great pictures...one more...YUMMIE! Oh Sweet Suzie... I've died and gone to heaven. That first pic just took my breath away...love at first sight. When given the chance, I will always choose the rocky road!! Oh my gravy... cut me a big hunk of this!!! Have mercy pleaaaase! Did you make this recipe at least 20 times more after your first try? They look that adictive to me! Oh my... these look delicious! I have to say personally though I would go for a brownie base, Im more of a goo fan than a crunch fan haha. Lovely photo's & will definately make these sometime soon! Oh dear - that last gooey bit is "da bomb"...I would so grab that out of your hands. ooooo i love that last pic! I am so glad you took the Rocky Road! These look delicious! WOW this look sensual. Your rocky roadness turns me on! The yummiest. You photo will add 600 calories. Chocolate + tons of pecans = Fantastic! These look delicious!